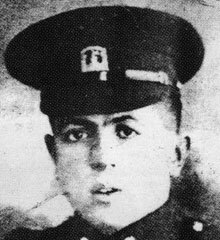 Fusilier Joseph Conlon was born at Annetermore, Ardboe, Cookstown, Co. Tyrone. Prior to service Joe worked as a labourer. The 2nd Battalion Inniskillings fought in many rear guard actions as part of the withdrawal to Dunkirk. 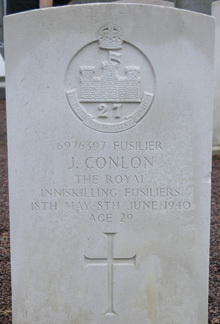 Fusilier Joseph Conlon was killed sometime between 18th May and 8th June 1940, he was aged 29. Gavrelle is a village and commune 11 kilometres north-east of Arras, on the N.50 road to Douai. The communal cemetery is south-east of the village on the road to Plouvain. There are seven British graves; they are in two plots which lie on each side of the main path from the entrance.